Delaney has been taking softball pitching lessons with Coach Sarah for a year. She is not only consistent with her lessons, she works hard on her own both between lessons and during the off season. Compared to her first lesson, she is unrecognizable on the mound with a new found focus along with drastically improved form, accuracy, velocity and confidence. It was no surprise she landed a spot on a 10U high level softball travel team! Congratulations, Delaney! You earned it, and we are all so proud of you! 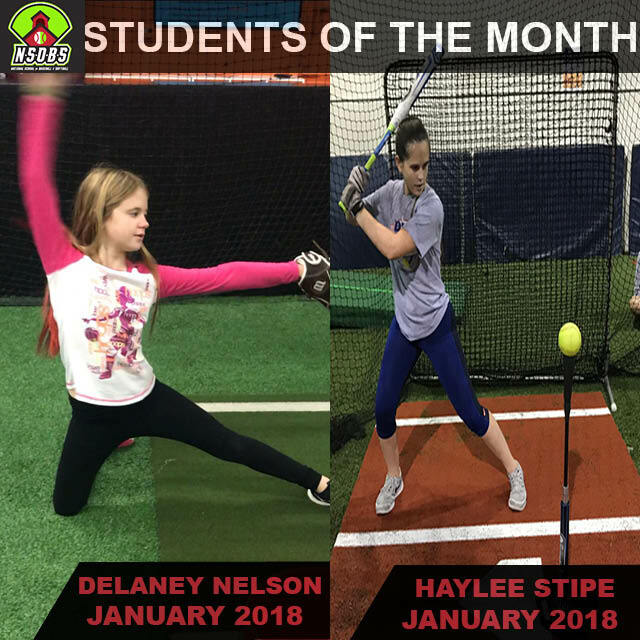 Haylee is not only a student, she is one of our very own – a member of our Illinois Venom 16U Girls softball team. It is hard to find students/players more willing to put in so much extra time with a burning desire and passion to improve all facets of her game, from hitting to fielding to physical condition. Coming off a shoulder injury, she has never stopped pushing. She has even gone back to one of her favorite positions, pitching, with a goal to become better than she ever was. She is on her way! She leads by example with incredible heart. A good player to begin with, she is on her way to becoming a great player! Congratulations, Haylee! We are so proud of you and excited to have you on our team!